I was concerned at first that this one sounded a little too much like a contemporary country song lyric. But, on second thought, those rough ‘n tumble folks whose lives are lived in the often harsh and unforgiving collision of disciplined ranch life with a relentlessly greedy marketplace do live lives not unlike a rhyming song. fossilized farm tools, rust in the roots. well before coffee, the horses get hay. barking insistently trouble to find. sisters and mothers got cobbed-corn to shuck. nor a vacation for he and his honey. despite hand-me-downs nigh as wore as the train. hands clasp in prayer, ‘cause their faith ain’t no fable. 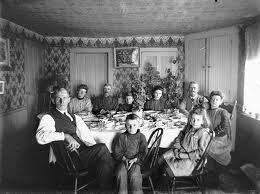 and they gratefully dine till their bellies are full. for six tired children too weary to care. for this place to survive there must soon come relief. till daylight returns a few hours too soon. kindly don’t think that these good folk will fail. ‘cause this is ranch life, where the lost can be found.